As today is World Mental Health Day sponsored by the World Health Organisation I’ve written this article on how the Principles behind Skicology™ have been applied in a slightly different setting: preventing young people being radicalised in to extremist behaviour. A programme sponsored by the UK Home Office. You might think how is this relevant to skiing, I hear you ask? Well, the implications are relevant to all aspects of life and work, not just skiing. For the purposes of this article I’ll focus on Well-Being as it’s most related to Mental Health (and ski performance), but the full article here also covers the changes in stress (down by 30%), and managing important aspects life e.g. health, relationships (up by 49%). In skiing, like all sports, it is assumed that a participants thinking and feeling, and hence performance comes from other people, circumstance or background. Well, you might be surprised that there is no causal evidence for this assumption – it’s one of the key things we tested in our programme with results you might find turns your world a little upside down. You don’t need to take my word for this as the UK Government sponsored research “5 Ways to Well-Being” came to the same conclusion. It is, after all, just an assumption. And because we are taught this assumption from an early age (e.g. so and so upset me), whilst we might think it true for us, doesn’t necessarily make it true. To be a true cause, like gravity, it has to be true for all people, all of the time. And none of the examples given above fit that criteria. If gravity was an assumption that ‘caused’ objects to go up as well as go down then it would make walking, skiing, flying, and driving incredibly challenging (and probably very interesting)! Fortunately, science has the inside track on this and has had so for some decades but sport has yet to catch up so I thought I’d share something ground-breaking, and game changing news that will make a significant difference to your skiing (and life) experiences. Essentially, buying in to the assumption that thinking and feeling, and hence performance comes from other people, circumstance or background means you are at the behest of this assumption – a victim if you will. Common strategies for this you may be familiar with are often called coping or improving confidence, motivation and willpower (Btw, these are effects not causes). At Skicology we know that none of these strategies work long term, for example, we forget to employ new skills when they would be useful, so being the curious people we are, we thought we would test this assumption, as no-one had before. To do this, we didn’t look at skiing – that would be easy. We turned to our sister business Headstuff™ that works in making intractable social and business problems go away. And for our research we worked with a group of young people who were at risk of being radicalised in to extremist behaviour. Tough challenge you say? Well, we don’t like easy problems so we thought we’d test the same approach we use at Skicology™ with a group who are considered ‘very hard to change’. After all, if we got results with them then we’d get them with skiers too. As participants realised that their feelings were independent of (rather than dependant/determined by) circumstance, background and other people, then their well-being, resilience and ability to deal with their lives directly improved. 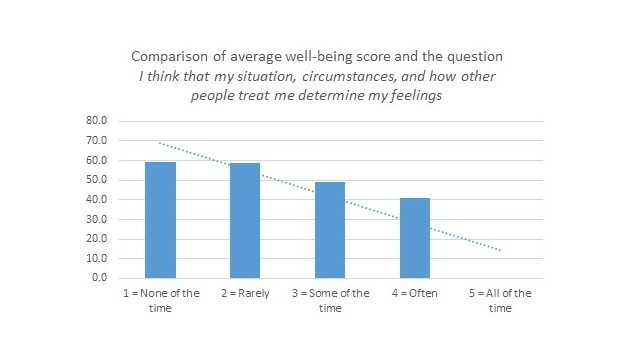 The more participants realised that feeling and thinking is not determined by circumstance, background and other people, so they experienced increases in their well-being. A difference of 45% from one end of the scale to the other. For comparison, a study in to the effectiveness of a 12 week programme of Mindfulness to improve well-being amongst school pupils (http://bjp.rcpsych.org/content/203/2/126) yielded a 3% improvement. Changing Minds improved Well-being by 16%. Essentially, as a consequence of discovering that minds change naturally (hence Changing Minds™), so did their behaviour, and their well-being improved! And they didn’t have to manage or cope or use willpower or gain confidence or learn new skills to manage it! Pretty cool huh! And their resourcefulness and resilience went through the roof too. If you want to hear it in their own words, here’s a short video: http://bit.ly/2vGHh24 What’s said in the opening scene might surprise you somewhat when you hear the changes of personal stories. The distinction is this: how you show up determines your experience of what shows up (circumstance), rather than what shows up determines your experience. So what does this mean for you and your skiing? At Skicology, we show you how Thought as a System (it’s OK, we don’t talk about the science!) explains human behaviour and how it changes. And it’s very simple, although sometimes too simple for some people to grasp! Essentially, we explain the illusion behind reality which means you are less ‘caught out’ by thinking and feelings. This is in much the same way that an illusionist – because they know how the trick works – can’t be caught out by their own tricks. But other people can, as they are not aware of how the illusion works – it looks very real to them! At Skicology, we create the conditions where you’re more likely to see the illusion and experience the consequences – without deploying techniques or strategies and using energy sapping willpower. And finally, if you’d like to see through the illusion (and assumption) and experience life and skiing differently, then get in touch with us at talk2us@Skicology.com or click here to receive a 30% discount off sessions booked in October, as our contribution to World Mental Health Day. If you’re curious about how Changing Minds™ could make a difference to the intractable social or business problems you’re wanting to go away then contact anthony@headstuff.eu or read more on the Headstuff website, which also contains details of our programmes, the impact, and how they work. Thank you and Happy World Mental Health Day!